The project.cfg (model configuration) file is edited by the user to customise each SysCAD project or project group. When the Edit | Project Configuration command is activated, the following pop up window will be loaded. WARNING: This is only available when a SysCAD project is NOT loaded. This tutorial video shows you how to add a species to the Configuration file. It also explains some of the Configuration functionality. 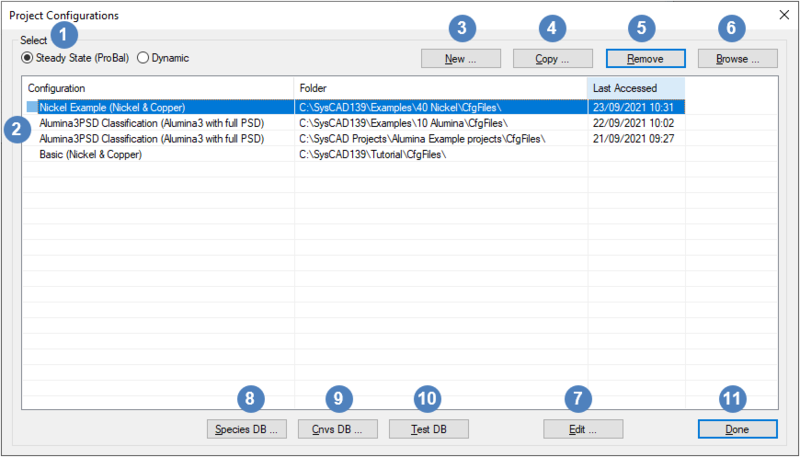 SysCAD always expects projects to be located in the same folder as the configuration file that they are using. This is not strictly enforced, and the user may store the project and the configuration files in separate locations. (This is not recommended, as it can lead to confusion). The user may check which configuration file the project is using by accessing the View - Project command. Please see Project Window - Files List for details. Enter the required name of the configuration file. If the check box Project Set Same as Config Name is ticked, then the project folder will be the same as the Configuration file name. the Folder path is correct. This is the default option and reduces confusion with folder names. The Files Folder is the name of the folder in which the configuration file and the species database will be stored. By default this is called CfgFiles. You may enter a description for the project in the Description field. The default for the root folder will be within SysCAD Projects, but you may browse and change this to any path. A folder under SysCAD Projects called SysCAD Training, containing a sub-folder called CfgFiles. 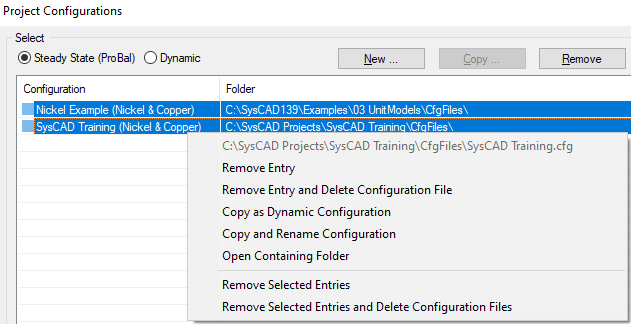 Files called SysCAD.93.db3 and SysCAD Training.cfg will be created and stored in the CfgFiles sub-folder. The species database will only contain steam, water and sulfuric acid at this stage. Highlight the configuration file you would like to copy and press the COPY button ). The first option allows the user to make a duplicate of the configuration file and set it to a different solver mode. If a dynamic configuration file is created, "_Dyn" will be appended to the file name. If a steady configuration file is created, "_SS" will be appended to the file name. The second option allows the user to make a copy of the configuration file and rename the file manually. If the first option is selected, the file copy will be automatic. If the second option is selected, you will see a dialog box almost identical to the one presented in Creating a New Configuration File. The only difference will be instead of the words Create New Configuration at the top of the window, you will see Create Copy of xxxxx, where xxxx is the file path of the configuration file you are copying. Follow the instruction as per Creating a New Configuration File to complete the dialog box. A folder under SysCAD Projects called Gold Project, containing a sub-folder called CfgFiles. Files called SysCAD.93.db3 and Gold Project.cfg will be created and stored in the CfgFiles sub-folder. The configuration file and the database will be identical to the configuration file and database in SysCAD Training, the original project. 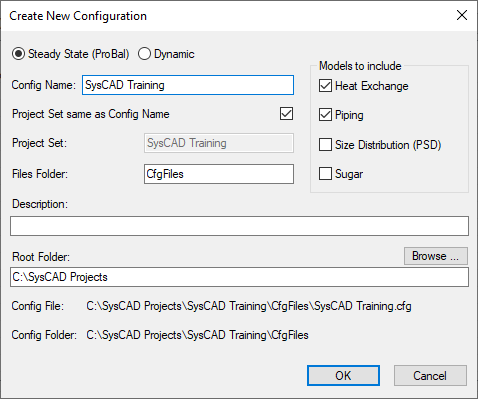 Therefore, they will contain all of the species that are available in SysCAD Training. Highlight the configuration file(s) you would like to remove and press the Remove button ). To edit the configuration file, select the file to be edited from the Project Configurations Dialog box, press Edit or double click with the left mouse button. To edit the User species database with reference to the selected configuration file, press Species DB button . To edit the User conversion database with reference to the selected configuration file, press Cnvs DB button . the entry (closest to the right click) will be listed here, the options listed in this top section will apply to this entry only. Remove Entry and Delete Configuration file: removes the configuration file from this dialog box and deletes it from the Cfgfiles folder. Copy as Steady State / Dynamic Configuration: allows the user to make a duplicate of the configuration file and set it to a different solver mode. Copy and Rename Configuration: allows the user to make a copy of the configuration file and rename the file manually. Open Containing folder: Opens Windows Explorer and jumps to the folder containing the selected configuration file. Remove Selected Entries and Delete Configuration files: removes all the configuration files from this dialog box and delete them from the Cfgfiles folder. This page was last edited on 28 May 2018, at 22:42.